Andrew C. Jones is an Assistant Professor at LCC International University. He joined the university in August 2016 after completing his PhD in Communication Studies at Louisiana State University in Baton Rouge, USA. 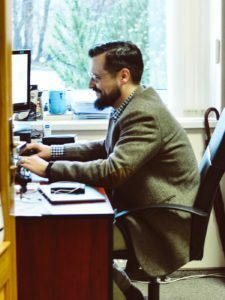 In addition to his teaching interests in the areas of Rhetoric and Social Change, Media Culture in a Digital Age, and Persuasion and Propaganda, Dr. Jones also researches and writes in the areas of political communication and the rhetoric of inquiry. This project focuses on integrating instructor research into undergraduate (BA level) coursework through project based learning using the eduScrum framework for product development. 1) In the first phase, which is already completed, the eduScrum framework was implemented in a Political Communication course so that students engaged with the tools of presidential public address scholarship and acted as expert critics for a faculty manuscript. 3) In the third phase, I will lead an open-access hybrid workshop on integrating the eduScrum framework into the liberal arts and sciences classroom. The expected product of the project will be a workshop presented at LCC International University to 60+ faculty members, streamed live through the LCC Facebook account, and archived on the LCC YouTube channel. What most attracts me to the Liberal Arts and Sciences is the prospect of exploring topics across disciplinary boundaries. For example, I currently have a project under review that explores how Edgar Allen Poe’s detective stories blend the role of the mathematician with the role of the poet. My co-author and I propose that Poe’s tales of ratiocination illustrate the need for creativity within even the most rigid of disciplines. Or, to put it in a different context, our scientists need the liberal arts now more than ever! This integration of disciplines brings lively debate into my courses, as students wrestle with ancient problems—such as the relationship between epistemology and praxis—that have contemporary applications—such as the evidentiary basis of legislative propositions.